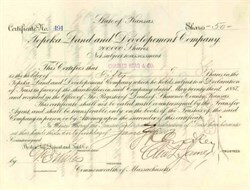 Beautifully engraved certificate from the Topeka Land and Development Company issued in 1887. This historic document was printed by the American Banknote Company. This item is hand signed by the Company’s Treasurer and Trustees and is over 115 years old.